Yes you read that right. 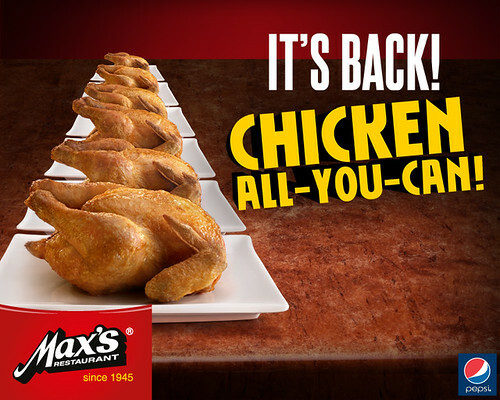 It’s Chicken-All-You-Can once again at Max’s! For only Php 199.00, we can once again experience eating all the Max’s fried chicken that our stomachs hearts desire. This already includes a glass of any Pepsi softdrink that can be upgraded to bottomless drink for only PhP28. The promo started last June 10, and will run until July 10, 2011. Chicken-All-You-Can is available between 6:00 to 10:00 P.M. So what are you waiting for? Attack na! One afternoon, I was hungry and looking for a snack in the kitchen. I found 3 whole pieces of saba which were left over from when mom cooked pocherong manok. I knew we had some pancake mix in the pantry so I decided to make maruya (banana fritter)for merienda. As I was preparing the bananas, I spotted a lone fuji apple in a bowl on the dining table. 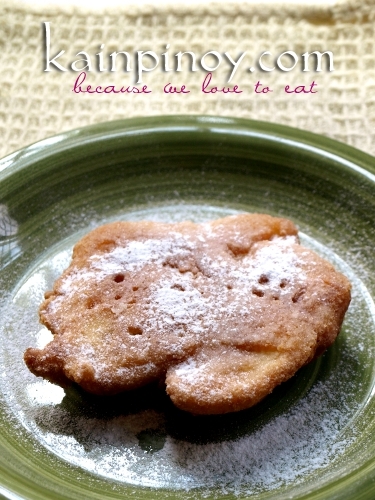 I decided I’d add that to what I’m making, so the banana fritters got upgraded to apple-banana fritters. March is almost over and the days are getting hotter. Summer is definitely here! It’s during these times when I crave for something cold to help cool me down, like gelato. There’s a gelateria that I love going to where I get some really good gelato. It’s called Caffe’ Ti Amo. Caffe’ Ti Amo is a gelateria cafe’ that offers Italian gelato and coffee in a fast casual dinig format. It was established in 2006 in Korea, where it has become quite succesful with stores numbering close to 270. Their first branch here in the Philippines is located at The Annex, SM City North Edsa, and they have since opened another one in Greenbelt. I’ve tried out a lot of the flavors of their gelatos from chocolate to green tea. But out of everything I’ve tried, the dark chocolate, coffee, mocha, strawberry and yogurt are my top faves. 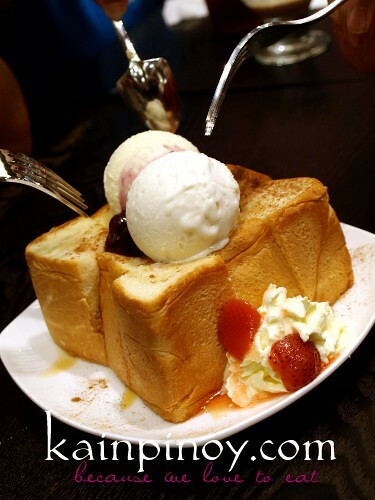 But aside from the gelato, Caffe Ti Amo also has Gelato Creations like the Honey Bread, which is a big chunk of loaf bread drenched in honey and served with scoops of gelato. 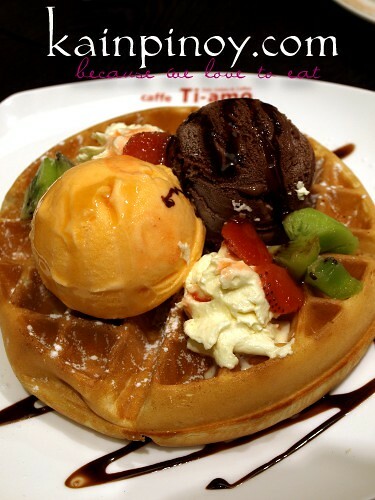 They also have different flavored waffles which are topped with gelato and slices of fruit. They also have Banana Split, Affogato, and 3 flavors of Mischiato: Yogurt, Green Tea, and Chocolate. 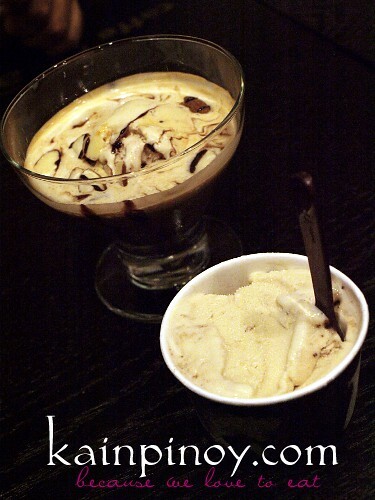 Affogato is a combination of hot coffee and gelato. And what cafe wouldn’t be without coffee? Caffe Ti Amo not only serves gelato, but offers coffee and tea selections as well. Caffe Ti Amo is definitely one of my favorite cafes to hang out in. 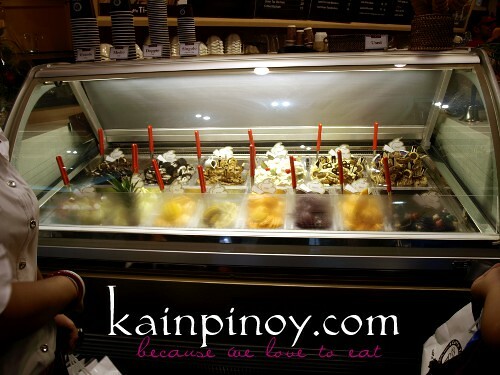 The place is cozy and inviting, the gelato and food are delicious and truly mouth-watering. Max’s Corner Bakery, the bakeshop brand of Max’s Restaurant, introduces its latest line of oven-fresh, delectable chocolate and vanilla cupcakes, garnished with sumptuous layers of sweet confections. 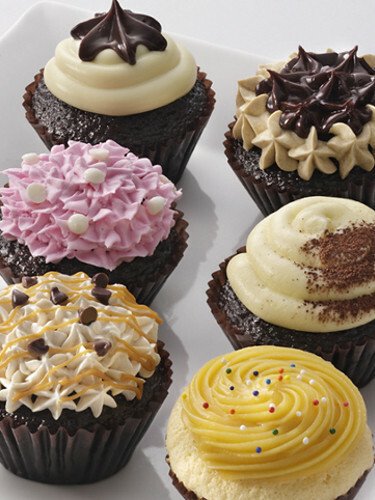 A definite eye-candy for anyone with a sweet tooth, Max’s Corner Bakery cupcakes are available in six variants: Cream Cheese, Choco Espresso, Choco Caramel; Double Chocolate; Choco Strawberry; and Troubador. In line with the Valentines’ Season, Max’s Corner Bakery is also launching its sweetest promo yet. 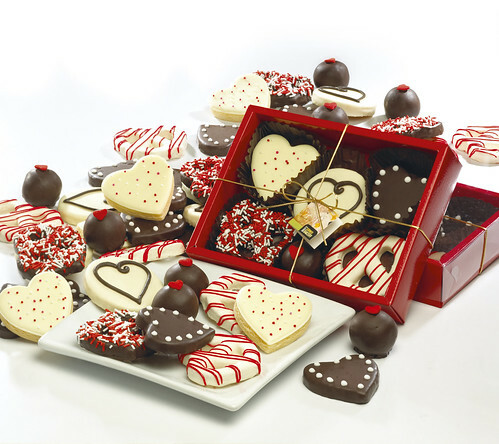 For a minimum purchase of PhP 1,500 from February 12 to 14, diners can surprise their loved ones with a special Valentines box of delectable chocolates – a free treat from Max’s Corner Bakery! To learn more about this promo, visit www.maxschicken.com or check out their facebook page. Christmas is the perfect time to celebrate and enjoy life, and what better way to express this than by imbibing the spirit of giving! Enthrall your loved ones and spread the spirit of giving this Yuletide season with festive Christmas gift packages from Delifrance . Each item is carefully selected into a fine array, making it a worthy find undeneath the tree. Choose from Delifrance’s premium selection of French wines, coffee, Christmas cookies and other baked confections, all packed in in boxes and containers of magenta and silver. Check out www.delifrance.com.ph for more information on the products and the Café Directory. Claw Daddy is a restaurant that specializes in dishes with crabs. But aside from crabs, they also have some meat dishes like BBQs and other seafood fare, a lot of which have that Creole flavor. It was one cool evening when my family and I, along with my aunt, went to have dinner at their Bonifacio High Street branch. For starters, we were served some delicious sweet corn as we were looking over the menu. We then ordered a plate of the Creole Crispy Shrimp for our appetizer. These are fried baby shrimps seasoned with a Creole rub, served with cocktail sauce and malt vinegar. This was so good. True to it’s name it was crispy, and the Creole rub gave the shrimps a wonderful flavor that was complemented by the dipping sauces. We wanted some meat, and their selection looks really yummy. We went with the BBQ Caboodle King Paddle size. This is a BBQ set that includes a full slab of baby back ribs, hickory BBQ chicken quarter, bountiful beef ribs, and Texas links. The meat was very tender and flavorful. Everything was coated in a sweet and tangy barbecue sauce. The set also includes 3 side dishes. The choices include: bourbon peaches, honey corn bread, dirty rice, rustic, mashed potatoes, mashed sweet potatoes, corn on a cob, crinkle cut fries, coleslaw, broccoli and cheese, and baked potato. We chose the coleslaw, rustic mashed potatoes and honey corn bread. The coleslaw is a bit sour, not like the coleslaw that we are used to. The rustic mashed potatoes are seasoned with just salt and pepper, and mashed with the skin still on. A great balance to these two was the sweetness of the honey corn bread. Dining at Claw Daddy wouldn’t be complete without sampling their crabs. The crabs on the menu are priced by weight. For a 600gm-700gm crab it’s PHP 100.00/100 gms. An 800gm- 1 kg crab is PHP 135.00/100 gms. ; and the ones that are above 1.1 kilos are PHP 145.00/100 gms. The crabs we got were 800 gms each. We ordered 2 crab dishes that evening: Crab Maritess and Szechuan Crab. The Szechuan Crab is a dish that has a sweet and mildly spicy szechuan sauce. The leeks give it that extra light kick. I love pouring the sauce on hot steaming white rice. Something new for me was the Crab Maritess. I love how this tasted! It’s sauteed in olive oil, white onions, chilies and garlic. Lots of garlic. Despite the garlicky aroma, which i really love, it has a very clean, light flavor. The garlic doesn’t overpower the flavor of the crab at all. To wash it all down, we had some really good watermelon shake. I like that it wasn’t too sweet, and that they used fresh watermelon. It was on the house. We found out that the restaurant is a partner establishment of Smart Rewards, and my aunt, being a Smart subscriber decided to use her points and rewards. So we got a pitcher of free watermelon shake to go with our dinner! We enjoyed dining more because of the great discounts, freebies and points that we got by using my aunt’s Smart Rewards. A delicious meal was had by all. Everything was satisfying. The food was great, and the service was excellent! I’d definitely keep coming back. Cocktales is the sister company of Fruitas, and seeing all the fruits displayed , one would be inclined to think that it is just a juice/ shake bar. But inspecting their menu proves otherwise. I was pleasantly surprised to discover that not only do they serve juices and shakes, but they serve sandwiches, meals and even dessert! Part of their savory offerings is the Spanish dish callos. It’s something I am very familiar with as it’s somewhat of a staple in our household; once only cooked during holidays and celebrations by my mom, until eventually when ever we feel like having it. I even shared her recipe on my other blog (with her permission, of course) . Cocktales’ version has the requisite mix of ox tripe, garbanzos and chorizo, but unlike my mom’s recipe, is a bit sweet, maybe to adapt the taste to the Filipino palate. I liked how it tasted but found the serving rather small. But then again I am a big eater, hahahaha! To wash it down, I ordered a fruit shake. The menu boasts of a varied selection of fruit based shakes. From simple mixtures to one of a kind concoctions. Deciding to stay simple, I choose the Peach Mango Smoothie- a combination of peaches and sweet ripe mangoes blended to a cool, smooth drink. A very refreshing drink served in a slim tall glass. I guess the small serving of the callos was actually a good thing because if it here as hefty as I wanted it, there wouldn’t be room for dessert! What meal would be complete without it? Cocktales’ dessert menu consists of fruit shake based desserts served with fresh fruits and sweet creamy desserts like panna cottas and tiramisu. To balance out the savory flavor of the callos, I chose something that looked light so I chose the Mango Cosmo. This stylishly-named dessert has a sweet mango shake base, topped with mango cubes, almond jelly and whole lychees. The sweetness of the mango is layered from top to bottom with the mango shake and the mango slices; and complimented by the light tart flavor of the lychee. The almond jelly finishes it off with it’s velvety -smooth texture. The items on the menu are varied. Aside from what I’ve featured here, there are hot and cold drinks, more desserts and other dishes like pasta and sandwiches. The savory dishes also come as set meals. Included are drinks and a dessert. The prices vary depending on what you’d want to have. Drinks and shakes can ordered spiked with alcohol, for an additional fee. Drinks and shakes start at Php 75.00. The Peach-Mango Smoothie is PHP 150.00 per order ; desserts like the panna cotta and tira misu are Php95.00 per order. The Mango Cosmo and other similar fruit bowls come in sizes: single and to share. 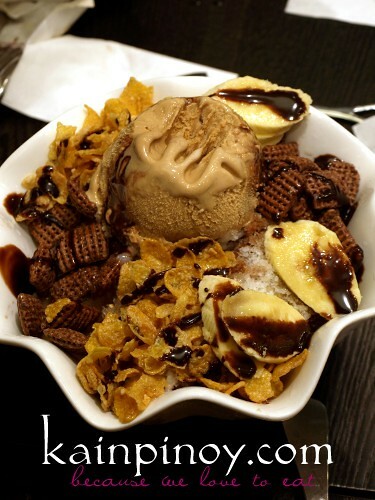 Prices start at Php 120.00 for the single and Php180.00 for the to share bowl. The callos is Php 175.00 for the solo and Php 245.00. Max’s, the homegrown brand that has recently created public hype with the biggest Chicken-All-You can promotion ever, is back with a hefty plate of new dishes to serve. 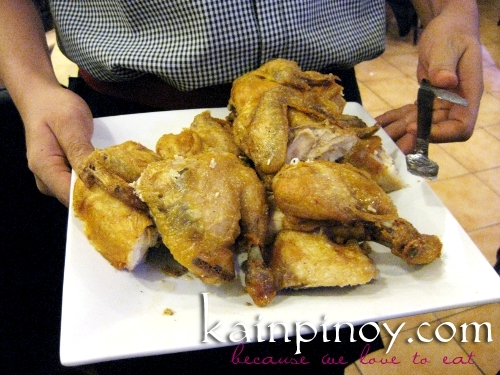 I got to sample these new dishes during their blogger’s night where I also got to eat all the chicken that I wanted. These two new offerings–Max’s Pork Binagoongan and Chicken Caldereta–are original recipes of Nanay Ruby, the restaurant’s first cook who developed the secret recipe for Max’s sarap-to-the-bones chicken. Sakae Sushi is not a typical Japanese restaurant, which offers the usual sushi and sashimi. Because of the expanded choices and the innovative way of preparing and serving food, the brand provides a culinary experience different from other Japanese dining destinations. I spent one evening in the company of fellow bloggers where we dined on Sakae Sushi’s offerings. I came in late so they’ve already started eating by the time I got there. It’s been an old-age saying that the way to any man’s heart is through his stomach.